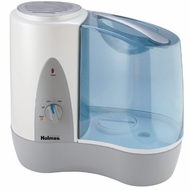 Designed ideally for small size rooms, this filter free warm mist humidifier provides relief from some of the harmful effects associated with dry indoor air. The humidifier contains two-speed setting and offers a digital humidistat that allows you to set the unit to your desired comfort level. Perfect for small rooms. Filter free operation. Two speeding setting for optimal control. Antimicrobial Product Protection is imbedded into the filter and key plastic parts for added peace of mind. Runs up to 24 hours per filling.